I love cooking with fresh tomatoes and, although the killing frost is but a month away, thanks to my freezer I will be enjoying homemade tomato sauce and the flavor of fresh tomatoes in all of my cooked recipes, all winter long. Freezing raw, heirloom tomatoes is one of the quickest and simplest ways to preserve the colors and flavors of summertime. 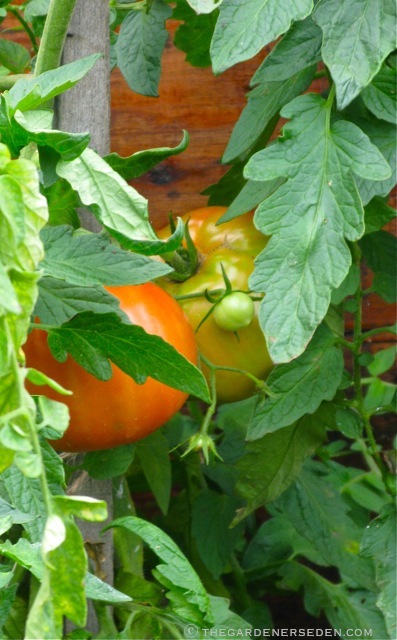 Find your garden producing more tomatoes than you have time to eat or can? Tomatoes can be frozen cooked or raw, skin on or skin off, whole, cut into sections, pureed or juiced. 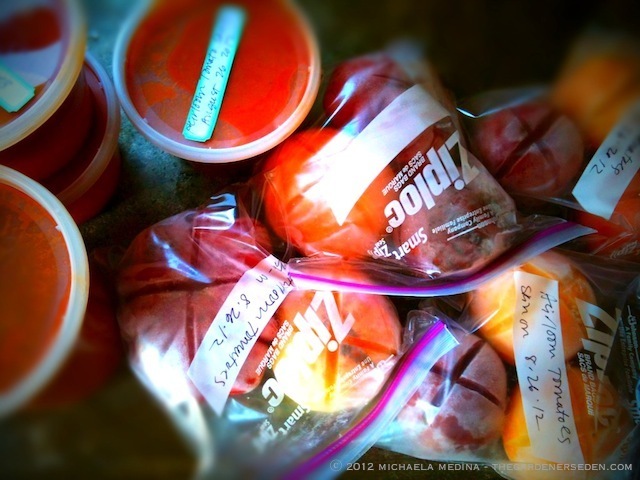 I preserve tomatoes in a variety of ways, but when I’m very busy —and who isn’t?— I simply freeze tomatoes without blanching or skinning. Later, I pull the tomatoes out and then blanch them (you can remove the skin just as easily after freezing and blanching) and can them, or thaw them and use as-is in my cooking throughout the winter months (freezing does destroy the firm texture, so don’t substitute frozen tomatoes for fresh in uncooked recipes). Follow the simple steps below to freeze raw tomatoes whole, and then process or add to cooked-recipes later. This method works so beautifully, I find myself wondering… Can I find a way to zip-lock and freeze a little more summertime? 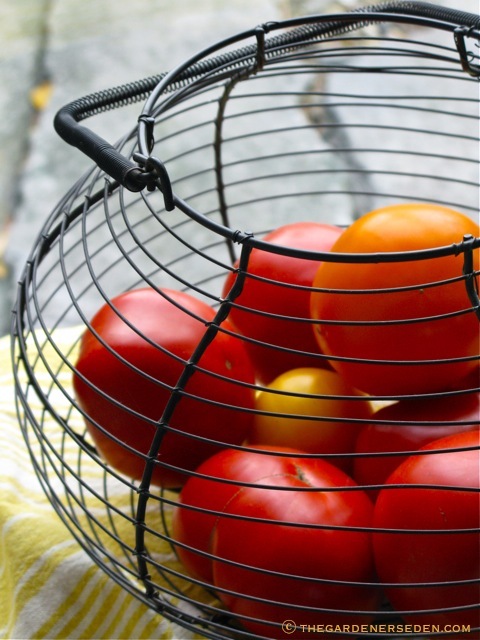 Select Only the Highest-Quality Tomatoes for Freezing; No Bruises, Gashes or Mold. Wash the Tomatoes and Gently Pat them Dry Before Freezing. 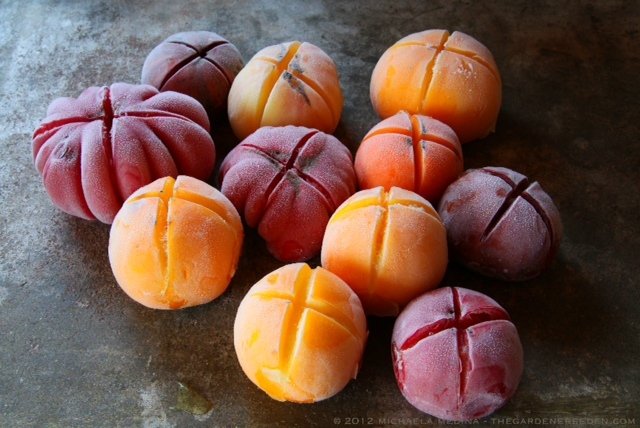 1) Select firm, ripe fruits for freezing. Choose the same high-quality tomatoes that you would use for a fresh tomato salad. 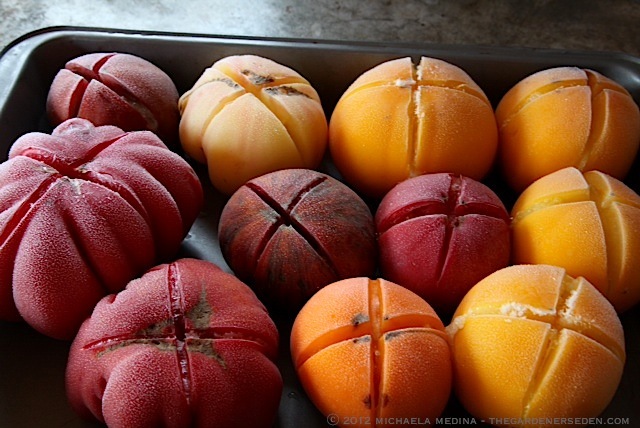 Avoid over-ripe fruits with bruises or holes and never freeze tomatoes with any sign of mold. 5) Remove the tomatoes from the freezer. Label and date large sized zip-lock bags (a quart sized baggie fits about 3 heirloom tomatoes). 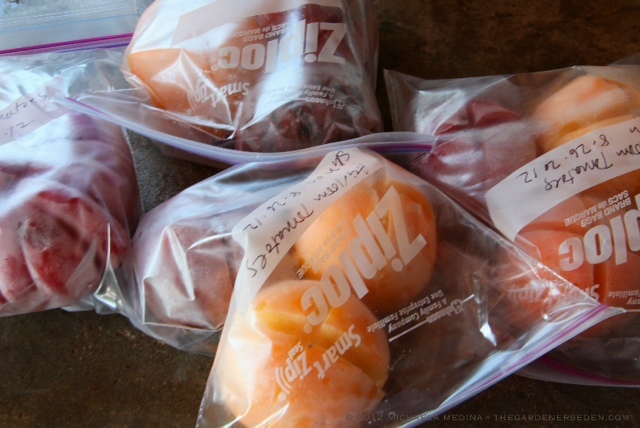 Slip the frozen tomatoes into zip-lock bags according to how you will use them: measuring by weight works well if you will be using them for sauce, or you can just fill each bag and measure later. Press out extra air and zip securely closed. 6) Return bagged tomatoes to the freezer and use within 8 months for best flavor. Try them thawed and used in sauces, stews, soups, juices and pastes. You can also blanch the still frozen tomatoes and remove skins. Use the thawed tomatoes in all cooked recipes as you would fresh tomatoes, but don’t substitute thawed, frozen tomatoes for fresh tomatoes in recipes, as the texture is ruined by freezing. See steps below for blanching and removing skins from frozen tomatoes (yes, you can postpone that step and do it later)! Prevent Explosion Upon Re-Entry by Marking the Tomatoes with a Shallow “X”. Place with “X” Facing Up and Arrange on Cookie Sheets or Freezer-Safe Pans. Stick in the Freezer Overnight. Remove Tomatoes from Freezer and Weigh or Bag Up According to Anticipated Use. Here, Whole Tomatoes, Bagged Up & Ready for Processing Later. Be Sure to Date and Label Your Baggies and Use Produce within 8 Months for Best Flavor. You can also puree or juice fresh tomatoes for use in recipes later. I also like to freeze fresh, homemade tomato sauce and tomato/vegetable stock. Always use containers intended for freezing and label/date ingredients. Sun-dried tomatoes are another low-labor way to preserve these heirloom treasures. Visit this page for more ideas on preserving the harvest by freezing and drying herbs, tomatoes and other produce. And for an easy intro to canning, check out my friend Jennifer Audette’s guest post on Dilly Beans —with canning resources— here. For important safety tips and helpful hints on the subject of food preservation —canning/freezing, etc— please visit the USDA’s National Center for Home Food Preservation online here. Beyond Freezing, Drying and Canning Tomatoes, I Also Try to Extend the Fresh Season by Utilizing Hoop-House Cold Frames. Click Here for Easy Tutorial Post & Build Your Own Mini Greenhouse! Addendum: Yes, You Can Remove Skins After Freezing Tomatoes! 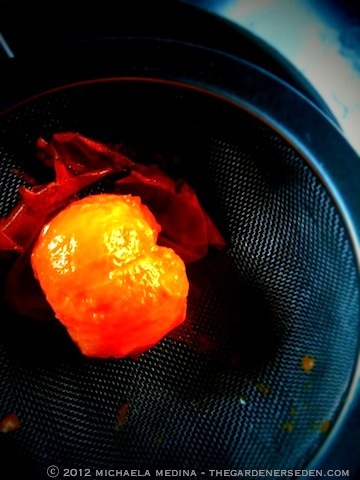 This frozen, whole tomato was blanched in boiling water for about one minute. You can see the loosened skin. 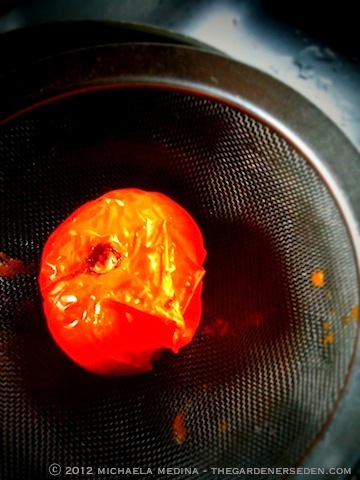 As soon as the skin is loose, remove tomatoes from water with a straining ladle, as shown. I’ve received a number of questions sent via email about removing the skins after freezing the tomatoes. Yes, you can easily remove the skins after freezing. You can do this when they are still frozen solid (works very well, actually, and is easier on your hands). Simply plunge the frozen tomatoes into boiling water for a minute or two, until the skins loosen, and then remove from boiling water with a straining ladle. Allow tomatoes to cool for a minute or two, then slip the skins off with your hands. They will come off very easily. Now, place tomatoes in a bowl and allow them to continue thawing in the refrigerator until you are ready to make dinner! You can now add them to your favorite recipe (use them for stews, tomato sauce, etc), or follow USDA instructions for canning (linked below). Skin easily slips from the still-frozen, blanched tomato (see it there, all wrinkly and cleanly pulled?). Now, place the tomatoes in a bowl, in your refrigerator and continue to thaw until it’s time to make dinner! 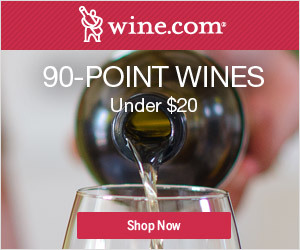 Add to your favorite cooked recipes. 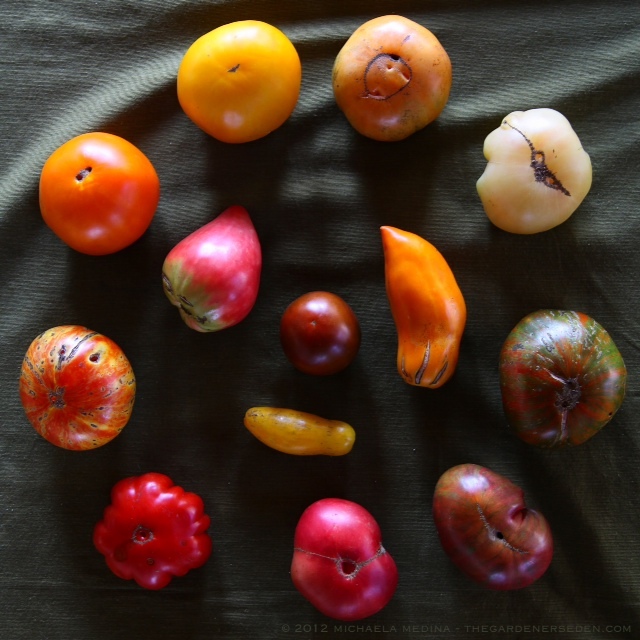 The texture of thawed tomatoes is too mushy for salsa or salad… But great for sauce. You can also can previously frozen tomatoes. Follow USDA guidelines (linked above) for safely canning food. If you are going to preserve the tomatoes by canning, thaw them and then prepare them as you normally would. Take all of the same safety precautions. I can not stress how important it is to follow the steps for canning recommended by the USDA (linked here). This post is intended for temporarily freezing tomatoes for thawing and re-using in cooked recipes. Photography and Text ⓒ Michaela Medina/The Gardener’s Eden. All images, articles and content on this site (with noted exceptions), are the original, copyrighted property of The Gardener’s Eden and may not be reposted, reproduced or used in any way without prior written consent. Contact information is in the left side bar. Please do not take my photographs without asking first. Thank you! 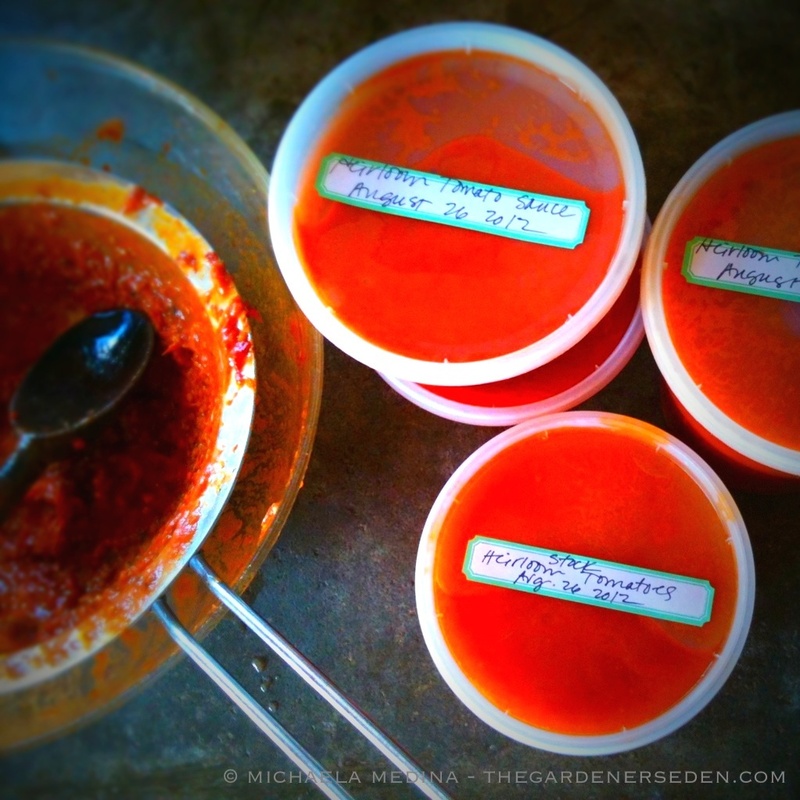 § 6 Responses to Heirlooms on Ice: Preserve the Harvest By Freezing Fresh, Whole Tomatoes …"
Never thought of that! We just spent the weekend putting up about 50 lbs of tomatoes. Lots of stews and sauces now sitting in the freezer and in cans on the shelves. If we had more of a freezer, I’d consider straight freezing most of our produce. But, alas, we do not and we are tight on space – so a chest freezer is still out of the question. Great blog, I’ll be stopping in more! i’m going to try this today! thanks for the great tip, Michaela!!! I just did this yesterday and followed the directions here. The tomatoes look like little gemstones in the freezer. What a great method. I have waaaaay too many tomatoes to eat this year. Have you seen tomato blight this summer? Thanks again, Emily. You are currently reading Heirlooms on Ice: Preserve the Harvest By Freezing Fresh, Whole Tomatoes … at The Gardener's Eden.